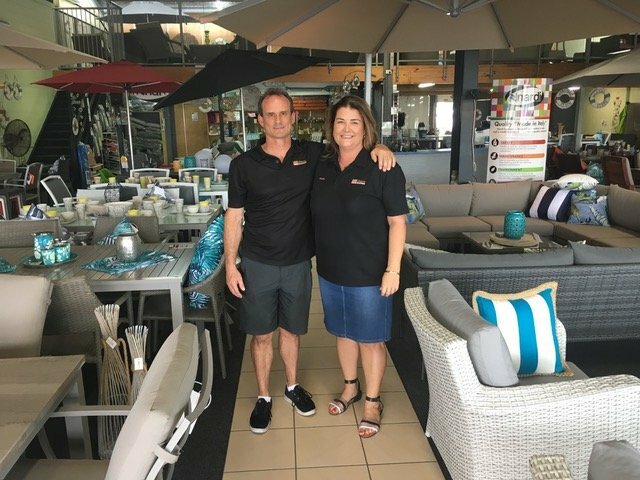 For well over 30 years now, Daydream Leisure Furniture has been operating on the Sunshine Coast. But for the last 20 years, we have been at the helm of this successful outdoor furniture business, building a retail presence and brand that we are thrilled to call our own. Looking back, we have many fond memories to reminisce on, including the many challenges we have faced from the outset to turn Daydream Leisure Furniture into our ‘dream come true’. In 2017 we are proud to celebrate our 20th anniversary at Daydream Leisure Furniture! What would the 40 something Jason and Alana, tell the 20 something Jason and Alana? That is what we are asking ourselves as we celebrate and reflect this year on our 20 years in business at the wheel of our successful outdoor furniture business – Daydream Leisure Furniture. The answer? Whatever wisdoms of caution and calculation we could impart to ourselves 20 years ago wasn’t and shouldn’t have been heeded by a young couple full of ambition. The hurdles and amount of blood, sweat, and tears which lay ahead of us then, have been navigated and replaced by new ones current and yet to be revealed. Together we agree, that the challenges we have faced and overcome, were the real reason for going into business 20 years ago. We wanted to challenge ourselves; it seems we must like the wind in our face. Let’s précis the last 20 years – It was 1997 and Daydream Leisure Furniture had already been operating 12 years. While friends were packing their backpacks and travelling, we had other ideas. We found this small, tired, on the way out, outdoor furniture business. A remnant of the glory days of PVC tubular furniture. In real estate terms it would be euphemised as a RENOVATORS DREAM. Up for the challenge, we were going to save this tired old business. The journey began with just the two of us, a little old showroom of 212 square meters, an old Subaru wagon with a rusty old trailer, and a mezzanine floor above the showroom where we had our very own ‘sweat shop’ that manufactured the PVC tubular furniture (and a fresh box of tissues each day for Alana, as she cried a lot). Now 20 years later the PVC ovens and generic wholesale sourced product offering has been replaced with approximately 830 square meters of showroom, large warehouses to store in house designed and directly imported products. We now boast two showrooms – Warana and Noosa and a staff of 13. Our tired 1990 Subaru wagon has long since been retired and replaced with a fleet of three commercial vehicles; all kept busy delivering and servicing the Gold Coast to Hervey Bay and beyond. We are happy to say, Alana only cries every second day now. There is no doubt that we have fostered a strong and loyal retail clientele. But our commercial/resort focus is what sets us apart. There aren’t many resorts on the Sunshine Coast that don’t feature Daydream Leisure furniture. In fact, along the East Coast of Australia right up to Port Douglas and down into central New South Wales you can lay by many a resort pool that Daydream Leisure Furniture has furnished. We have also supplied outdoor furniture overseas to establishments in Vanuatu, Bordeaux, Fiji, and beyond. Being an independent, family owned business has given us the autonomy to make our own decisions and set upon exciting and fruitful new paths. As we reflect, we agree that possibly the biggest directional change was the decision in 2000 to leave the relative safety of a large wholesale sourced brand name and venture into importing our very own style, range, and branded product. We are incredibly proud of the direction this decision has taken us. Now we confidently import directly from manufacturers around the globe. Although not without its challenges. Becoming direct importers has been the most rewarding step for us. Not only in the personal satisfaction of having our own product, but also in terms of the skills we have had to acquire to achieve this level of business. Hard work and dedication are the backbone of any successful business. We can and do laugh about the tribulations of having a seven-day business for 20 years. Many late revelous Saturday nights have been spent with the knowledge that tomorrow was a work day. Many public holidays spent at the wheel. Our two teenage boys spent their infant years tucked under a counter in our showroom, but now enjoy the benefits of after school and weekend employment in the family business. What has made it all worthwhile, is we have met and worked with many wonderful people, had the opportunity to travel, and have engaged in new skills and experiences as well as being able to give back to the community from which we take. We are happy to say that we still wake up everyday keen to get in and work on the next project. Who knows, maybe we have another 20 years in us. Most people assume that the aim or function of our business is to make money, and indeed this is a necessary facet of it. But what has unfolded for us and is clear after all this time, is that it is the satisfaction, achievements, and challenges that has kept us going. The advice we would like to give to the 20 something versions of ourselves going into business is; apart from the obvious advice of work hard, offer a good value for money product and/or excellent service. Our strongest message; make the focus on building something you are proud of, because it has your name on it. Daydream Leisure Furniture is our legacy, one we are proud to have our name on! Fall in love with being outside again – fall in love with the legacy of Daydream Leisure Furniture, because we certainly have and hope to continue for many years to come. Contact our friendly team today and watch your outdoor dreams come to life. Proud Owners of Daydream Leisure Furniture.